We originally wanted to stop for a couple of days in Mancora for a bit of beach time but, with the border crossing problems we had encountered and the fact we had already taken a detour, it left us short on time. So instead we opted to take a bus straight to Chiclayo. We soon learned that unlike other countries we had visited, Peru does not always use main terminals for their buses, instead each company has its own office and bus terminal. As such, it is advised to always ask whereabouts in a city you might end up. 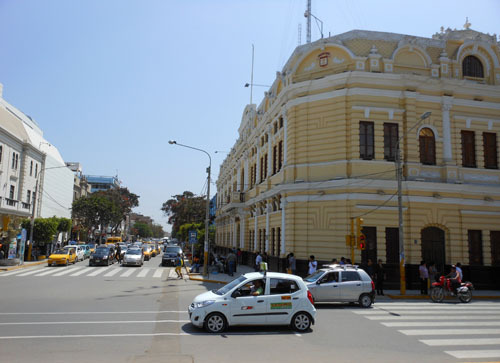 You could be excused for thinking that Chiclayo may be a bit of a run down area as you approach it. In fact, the outskirts of the town look something between half build mud shacks and industrial ventures. 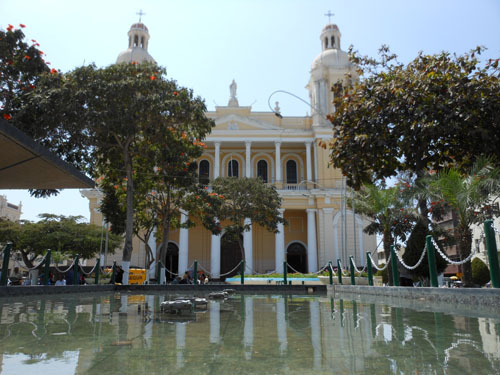 But as you come into Chiclayo you find the heart to be a different matter. The town is consists of pretty buildings centered around a central plaza with plenty of hotels, restaurants and shops, and surprisingly a large number of banks. 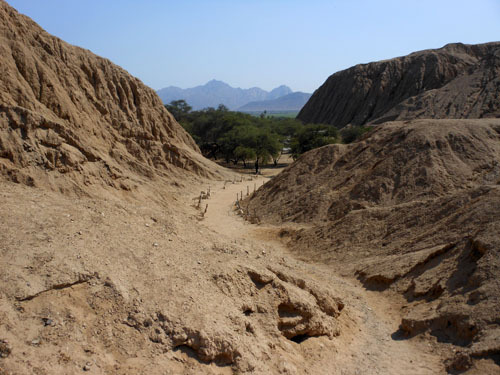 Our main reason for visiting Chiclayo was to see the archaeological site of Sipan and the respective museum in Lambayeque. 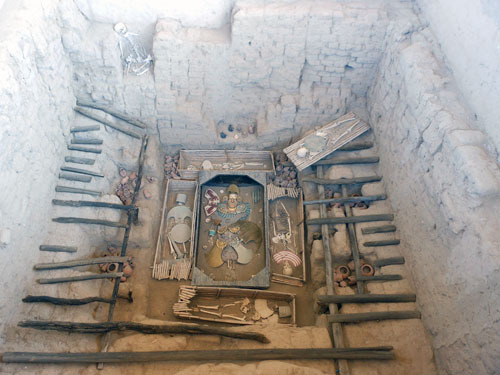 Sipan was at the heart of the Moche civilisation and the site had been a treasure trove of discoveries with 12 royal tombs, including that of the famous El Señor de Sipan. As we were short on time we booked ourselves in for an afternoon tour of the 2 sites for 25 soles each. What we didn’t realise was that for that money we actually got ourselves a private tour! Our first stop were the ruins of Sipan, located about 40 minutes away. Here we were able to look around the 3 pyramids, which now due to weather erosion look more like giant mounts of earth, and the burial chambers in where the tombs were found. These were made up of 9 levels in total, representing a hierarchy of social status, with El Senor de Sipan being at the at the top and soldiers of importance at the bottom. There is a small museum located at the site and entry to the 2 places is 8 soles each. After our tour of the ruins we headed back towards Chiclayo and went to the town of Lambayeque, where the Tumbes Reales museum is located. The place has been built to allow visitors to experience the finding of the tombs for themselves. The museum is distributed over 3 levels, with each level showcasing amazing gold, bronze and textile ornaments and artefacts found at the site. Unfortunately, no photography is allowed. They are so strict that all bags, cameras and phones have to be left at a luggage storage facility. Despite this strange regulation the place is truly worth a visit and you can easily spend 2 hours walking around from exhibit to mummy. The entry is 10 soles each and well worth it!